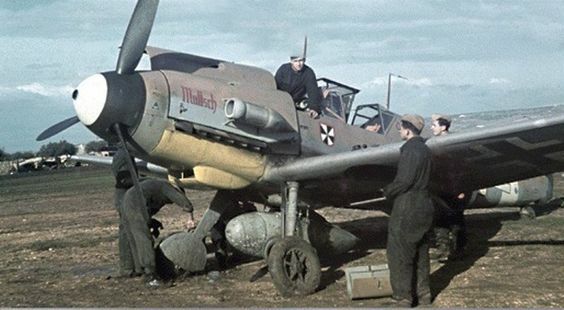 FalkeEins - the Luftwaffe blog: long lost Bf109 K-4 "white 16" JG53 Reichenbach photo - pops up again (and again) on Ebay ! long lost Bf109 K-4 "white 16" JG53 Reichenbach photo - pops up again (and again) on Ebay ! This very nice image is currently available on Ebay and the seller has it listed as "..a 3x5 original photo taken by my uncle. 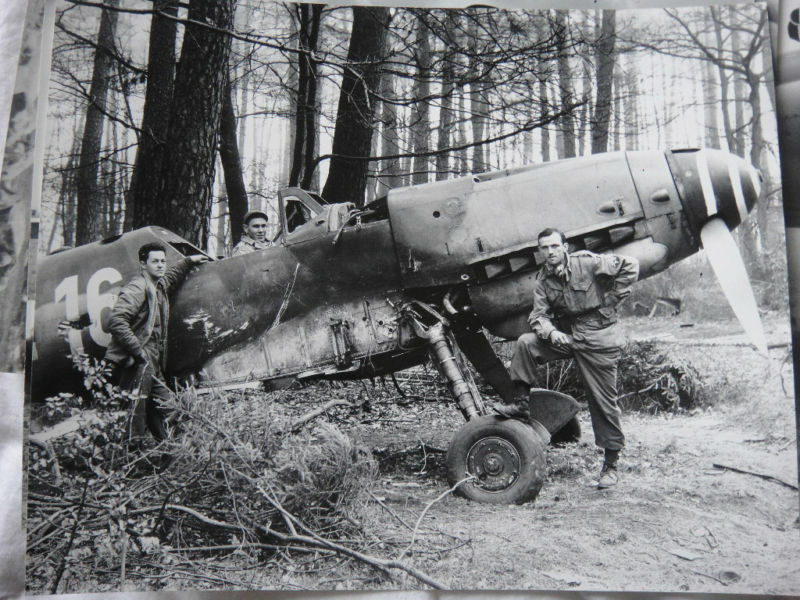 On the back of the photo he states: ....by a Messerschmitt 109 that had been forced down in the woods. Taken April, 1945 near Aschaffenberg, Germany..". However - unlike some of the gems that do crop up on Ebay, this aircraft - if not always quite the same photo(s) - has been seen again and again ...and again. And not just on Ebay. - page 177 of "Messerschmitt Bf109 F, G & K Series" by Prien & Rodeike along with a caption that claims it is: "The remains of "White 16", a Bf109K-4 of 9./JG 53 as it looked at a forward airfield in Southern Germany after the wars end. Note the broad band with the Gruppe bar behind it. Clearly visible are the large mainwheels and broad propeller blades (copyright: Petrick) "
- on the web @ messerschmitt109.de. Go to section Me109 version K4, page 1/4, " white 16 Staffel 9, Gruppe III JG53 in Reichenbach in April 1945"
- P103 'Bf109 Late Versions Camouflage & markings' by MMP; profile artwork by Krzysztof W Wotowski. Attributed to 9./JG53, location Reichenbach. - P1087, JG 53 history (Prien). Also two further photos which clearly show the III Gruppe bar. - P81 Kagero Monographs #29 Bf109G/K vol.III by Janowicz, two nice clear images credited to Crow. No GIs in the pictures. As I mentioned not only does 'white 16' appear in lots of different books and on the web, it also pops up regularly on Ebay - it was last discussed in detail in 2007 on TOCH after another Ebay appearance. According to Richard Lutz contributing at the time, Jim Crow "got these from a GI Photographer on 4x5 negs. Captioned as from Bf 109K-4 white 16, I./ JG 53 at Lechfeld, Jun 45 ".
" ..an original photo taken by my uncle .." ..very possibly given the number of GIs who posed for souvenir photos with 'white 16'. Or until next time perhaps. Thanks to Chris and Goran at the Luftwaffe Experten board for assistance with the bibliographic references.